Give Zuzu a safe future! Zuzu (5) has Down Syndrome. He will be deported to Iraq, a country without proper care, so he gets sick. Sign this petition to make your voice heard and avoid deportation! Zuzu is fife years old, but in his development only a boy of less than two years. Two years ago his mother Khansaa flee from the war in Syria. Together with Zuzu and his older brother Ali (16) she had to seek refuge in the Netherlands. While she was forced to leave her husband and daughter behind in Syria. It was not the first time that Khansaa had to search for safety. In 2004 she left Iraq in the violent aftermath of the second Gulf war. She went to Syria, the county her husband was born. Zuzu was born here and it was safe until the war started in Syria. And like any mother would do with a child with Down Syndrome and a vulnerable health? She decided to bring him to safety. Two years later Zuzu is in the Neatherlands, still afraid of water. It reminds him of the scary journey in an inflatable boat on his way to safety. Khansaa and her sons hoped they had found safety in the Netherlands, but their hearts are not at peace. Behind Zuzu his smile is a traumatized little boy that only sleeps with the lights on. Khansaa is worried about the future of her children. Aspecialy now that the Dutch government wants the deport them to Iraq. In this county Zuzu has no future at all. 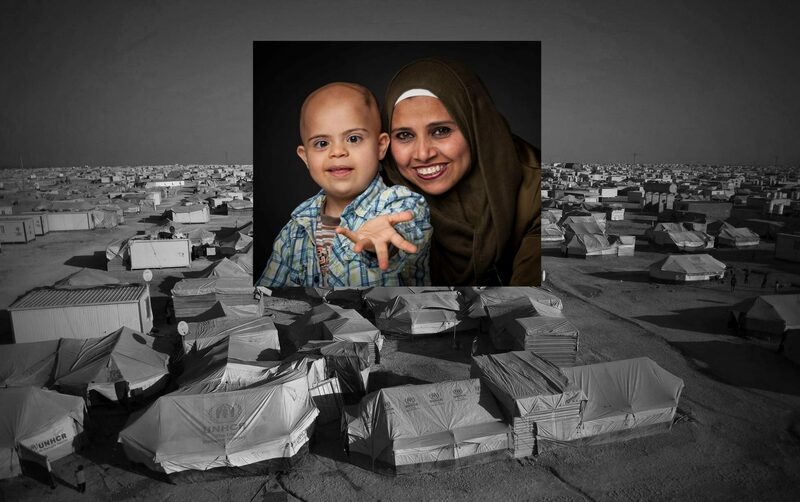 He will end up in a refugee camp, where his weak airways can’t resist the harsh conditions and bad hygiene. His development will decline, just like when he was moved from the Den Helder asylum center to the asylum center in Amersfoort and couldn’t go to a specialized daycare center for four weeks. Without professional care Zuzu changes in no time from a happy likable little boy into a very unhappy traumatized child. In the specialized daycare center in Amersfoort Zuzu recovered and regained the few words and songs that he had learned. He loves drawing and crafting, but in a Iraqi refugee camp it lacks all the care that he needs. Everything he had learned will be lost and in no time be erased from his memory. The pediatrician and psychologist that care for Zuzu also say that he will go back physically, mentally and in his development. Zuzu is not safe in Iraq. His mother, as a single woman, won’t be safe eather. And his big brother Ali? Will he have a safe future in Iraq? Demissionary minister Stef Blok would like to deport Zuzu. Which will bring this little boy in a life threatening situation. Please sign the petition if you think this is wrong!